Here’s an example (Pic 1) of an older banknote, now 40 years old, with the emblem of the Aztec Sunstone on its face. 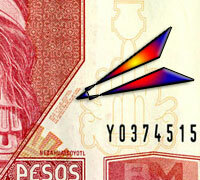 In 2006 we could only find one modern banknote - the red 100 Peso note - with a connection to ancient Mexico. 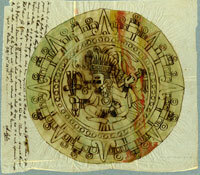 On the back is the god Xochipilli (‘Flower Prince’) (main picture above). On the front (Pic 2) is the image of the famous poet-prince, Netzahualcóyotl, crowned ruler of Texcoco in 1431. 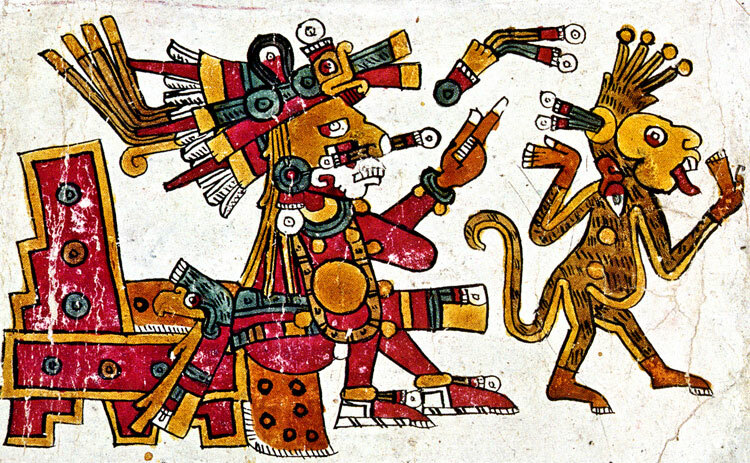 Xochipilli was essentially ‘one of the good guys’ in the ‘pantheon’ of Aztec gods - youthful, fun-loving, associated with summer, flowers and plants, good health, pleasure, wellbeing, the arts, music, dance and general playfulness. He was the patron god of the daysign Monkey, and the monkey was Xochipilli’s ‘nahual’ or companion spirit. 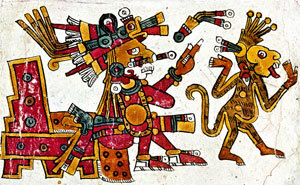 His brother was Macuilxóchitl (‘Five-Flower’), god of games, gambling and festivals. If you click to enlarge Pic 4, you’ll see clearly Xochipilli’s characteristic yellow hair and red body paint; not nearly so easy to make out in his face - though experts claim it’s there - is the white stylized image of a single butterfly* wing. Can you see it?! Well there you go! We never realised that, Tecpaocelotl, many thanks for pointing this out. Click on the link below to see the poem - it’s hard to read even with a magnifying glass! The Aztec god of flowers and dance, named Xochipilli whose name in Nahuatl, the language of the Aztecs means Prince of Flowers was also called Macuilxochitl which means “five flowers”, which I believe is a possible reference to the five Venus cycles and an esoteric reference to sacred mushrooms. 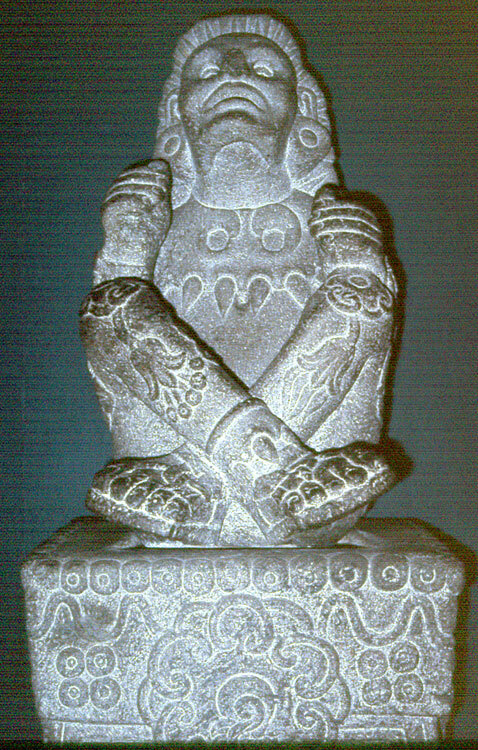 The statue of Xochipilli now sits in the National Mueseum in Mexico City where he can be seen seated upon a temple-like platform I believe is dedicated to the planet Venus and identical to platforms depicted on carved stela at Kaminaljuyu, and Izapa (see mushroomstone.com). Both the statue of Xochipilli and the base upon which he sits are covered with iconography of Venus, mushrooms and other entheogenic plants. Xochipilli has been called the god of flowers and dance, and it should be noted that sacred mushrooms were also referred to as flowers. Spanish chronicler Fray Sahagun records that “Whenever there was singing and dancing, mushrooms were to be eaten” (Los Primeros memorials, Sahagun). According to Sahagun...“He who eats many of them mushrooms sees many things which make him afraid, or make him laugh. He flees, hangs himself, or hurls himself from a cliff”. Sahagun was likely the first to record the use of mushrooms, in his famous Historia General de las Cosas de Nueva Espana, written between 1547 and 1582. Sahagun wrote that the Indians were using mushrooms (Teonanacatl) and that these wild mushrooms could be found in grassy fields and pastures and that the Indians were using mushrooms in religious ceremonies, where it was believed by the Indians to be the flesh of their gods, and that the mushrooms produced powerful visions and voices that were from God. 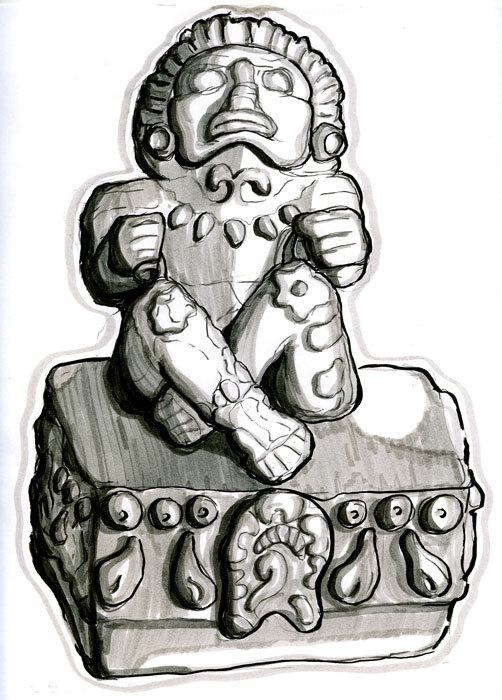 Sahagun also was the first to identify six psychotropic plants used by the Aztecs (see Xochipilli statue) in rituals, and recorded them in their respective Nahuatl (language of the Aztec) names, ololiuhqui (morning glory), peyotl (peyote), tzintzintlapatl (? ), mixitl and tlapatl, both are Datura species, Datura stromonium and Datura innoxia, known to possess strong hallucinogenic qualities. The Datura flowers opens and closes at irregular intervals during the evening, earning the plant the nickname Moonflower (Wikipedia encyclopedia). And the most sacred of all of God’s flowers nanacatl (mushrooms) also could be found on the pine covered slopes in the surrounding mountains after the rains. Sahagun also described the mushrooms effects and their use in several passages of his famous Historia General de tas Cosas de Nueva Espana, written between the years 1529 and 1590. 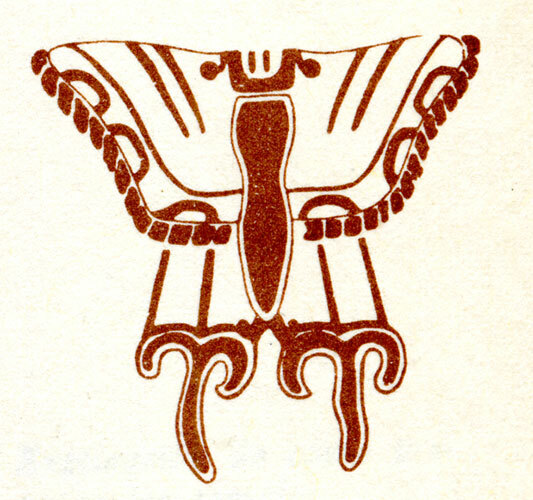 In book #9 Sahagun makes a reference to mushrooms, and merchants, and their celebration of great feasts, and states that merchant groups known as the pochteca, which translates as priests who lead, were devout followers of Quetzalcoatl, who worshiped Quetzalcoatl under the patron name Yiacatecuhtli or Yacateuctli, Lord of the Vanguard. Fun fact: In front of the 100 pesos on the right the potrait of Nezahualcoyotl and above his name, is one of his poems in very small print. Currently, all mexican coins display a different element from the “Piedra del Sol” monolyth.